I’m a fairly big advocate for the Windows Phone platform. But that’s not to say that there aren’t frustrations that come along for the ride. Some incompatibilities are understandable, but others seem to have no reasoning whatsoever. The most frustrating example is the Personal Capital dashboard when I try to log in to their portal. Ugh. I joined Personal Capital last year and have thoroughly enjoyed their customer service and their technology. But it’s surprising that a company who prides themselves on their technology will ignore the Internet Explorer built into Windows Phone 8.1. Needless to say, Personal Capital is also lacking a Windows Phone app. So this means that I have no remote access to my account when I’m on the go. It doesn’t even offer a limited experience; it offers NO experience. What is so special about their website that it can’t run on the mobile version of Internet Explorer? Other messages are less surprising. 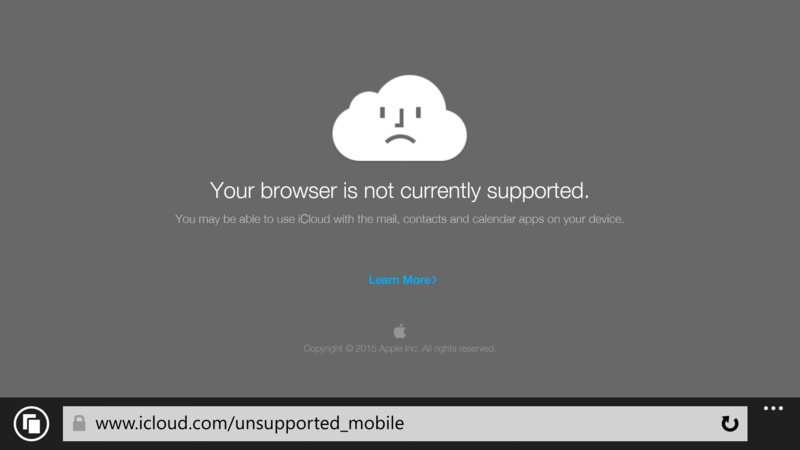 I clicked on a web link that apparently led to Apple’s iCloud service. You gotta love the sad cloud visual. Apple is so sincere! I’m certain that every platform has its frustrations. And while I still love using my Windows Phone, I hate having to make compromises like these. I’m hopeful that some of the new enhancements coming to Windows at large — universal apps, to name one — will spur developers to get excited about the platform.